It’s no secret that swimming laps is one of the best low-impact exercise regimens one can dive into in the never ending quest to get in shape. However, not very many people have Olympic size swimming pools in their back yards to take advantage and achieve their goals. Well, with the Home Swimmer, smaller pools and even a portable “dough boy” style pool can be used for lap swimming. It can even be brought on a trip or used by business travellers since it weighs less than 5 Lbs and comes with it’s own carrying tote bag. This makes it hotels, apartment buildings, even schools. It promises to be easy to install and use as well. Users simply join the poles, attach the poles to the base, and add straps and belt. Then attach the system to any anchoring point up to 12 feet from the edge of the pool, adjust the belt around your waist, and start swimming. The high tension spring even provides the necessary resistance while you swim. 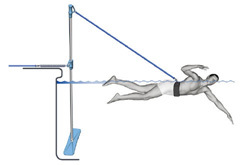 And although it may look like a human rishing rod (as Crave puts it), this system could be a very interesting tool for those wishing low impact exercise but have no pool lanes to do it in. I do not think I would want to explain what things to the TSA but, I can see the usefulness of this device. I believe it may take some training to get used to. I like this gadget — it’s like the poor man’s Endless Swimming Pool.